I’ve not blogged for over a week now. It’s not for the lack of trying, I just can’t find the bloody time. I’m shattered! How do you parents do this? How do you do it with multiple offspring? (I’m not in a hurry to find out!) I mean I know I have to do it but HOW? My mind is full of things to remember for work, things to remember for nursery, Willow’s first birthday is coming up so I need to organise a party, the house is a tip – zero cleaning has happened for longer than I want to admit to, we need to do a food shop, she’s grown out of most of her clothes…. Argh! I feel like I’m losing the plot. My day: Wake up after roughly 5 hours sleep, get self dressed, get baby dressed, get baby breakfast, deposit at nursery/grandparents, try to function at work, fuel with coffee, palpitations by lunch time, go home, play with baby (such precious time I look forward to all day), feed baby, bath baby, start negotiations about going to sleep, finally get baby down, put house back together, feed self, think about being organised and making lunch and ironing clothes for next day, sod that too tired, go to bed, baby awake…… Sound familiar? I always thought I was an organised person but this is on another level. ‘Winging it’ has become a well used phrase since I had Willow but do I owe her more than that? I’m not saying there is anything wrong with this but last week really made me think. Here’s what happened….. In my last blog I told you how I was enforcing my position as sugar police at nursery – all very well until the first day when I dropped her off and realised she didn’t have any shoes. Not that I’d forgotten to put them on, she didn’t have any because we’ve never bothered with them before now (I thought you bought shoes when they started walking hmmm…) I was mortified, evangelising about sweets and biscuits and the poor kid has no shoes (she has lots of lovely socks by the way) . 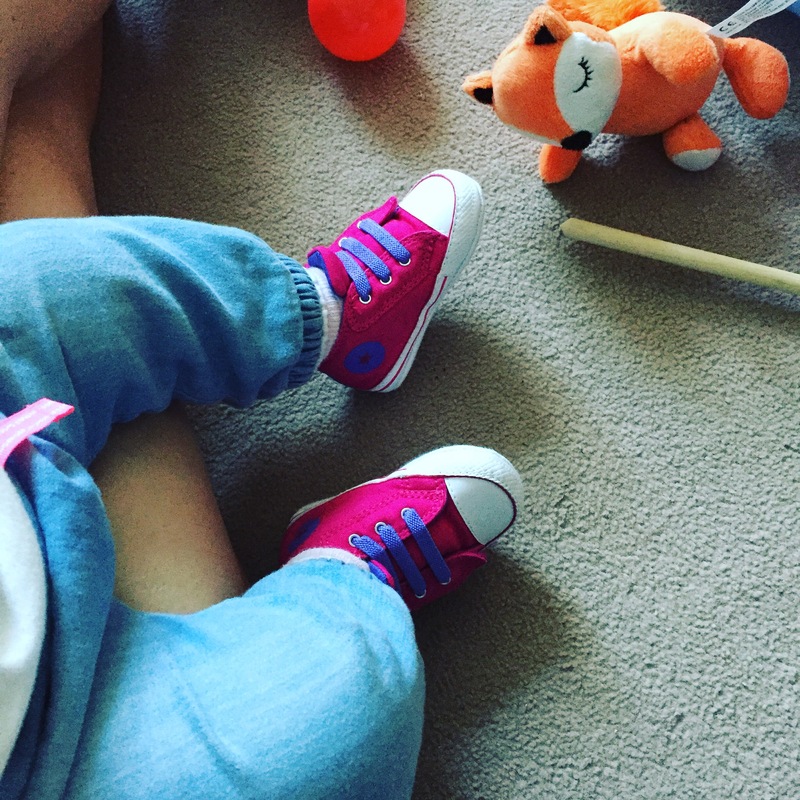 Enter her super duper grandma and Auntie who took her out and bought her first pair of converse which she is now rocking with great pride. I quite clearly have my priorities all wrong. Kids will find a way to eat sugary contraband (she’s been devouring custard with abandon at nursery) but they can’t buy themselves shoes for Christ’s sake! She’s babbling away all the time now (it’s super cute) and I’m pretty sure she’s trying to tell me to “Get it together mummy !” Well darling if you would sleep for longer than three hours at a time, mummy may be a bit more rested and able to think past the next few hours. It’s a catch 22 though because even if she did sleep I’d still be awake thinking about all the stuff that needs to be done. I have a week off work next week so I’m determined to get my shiz together. House blitzed, birthday party organised, new clothes purchased and cupboards stocked. But then what of the week after? I know that we’re all doing the best we bloody can, just muddling through one day to the next but seriously if any of you can offer any pearls of wisdom as to how to manage this then please let me know. I think us parents are too harsh on ourselves. We need to stop sweating the small stuff and over analysing every last little thing. I guess at the end of the day Willow was none the wiser about having no shoes and she gets her fill of custard. She has everything she needs albeit her clothes are a little tight. I genuinely am doing the best I can. In fact thinking about it I reckon she would rather I maintain this level of crazy. It all becomes clear now…she has a plan to sleep deprive mummy into submission and cake…. I’m on to you little miss! The truth is, we’re all winging it! You’re doing a fab job mama. Forgetting the shoes is no big deal. She won’t remember. I forgot to pick one of mine (she shall remain nameless) up from the childminder once. Was sat in front of the tv with a nice hot cup of tea thinking that something didn’t feel quite right!